No wind, No Worries - Walkerjet is here! It has been over 2yrs since I moved back from Hilo, Hawaii and I finally flew my motor. With little to no wind posting at our normal sites this weekend and last, I decided to dust off the paramotor and head out to Sandy Beach. My first attempt at Sandy's left my precious motor going to the doctor in search of reinforcements and new props. I had attempted to take off on a normal trade wind day with the wind around 8-10 mph out of the NE. My wing came up beautifully and and then immediately dove to my left. I corrected and again she was overhead. Ready, set and go....... or so I thought. I hadn't flown my motor for 6 months or so and I was itching to get in the air. I failed to notice that the wind had changed direction. a.) The first hint was when the wing immediately pulled to the left and required some major corrective actions. b.) The second was that I was flying fast just 3 feet off the ground without getting any altitude (now what kind of flag should this have sent up?) Maybe I was't taking off into the wind....da! The bush pile in the middle of Sandy Beach Park was quickly approaching so I let off on the throttle and powered down. At first glance it was not a bad landing at all. Not pretty by any means but nothing that would cause the damage that followed. I landed on my feet but the bottom right corner of my cage hit the ground (not suppose to happen) and the aluminium cage flexed in about an inch. At which point the first blade of three made contact with the cage, pop, pop and pop.....$700 to my brain.... After picking up my pride I cut the power to the motor and started assessing the damage. New propeller $700, new cage $1100 a new sport without a motor (free flying?). Ok, so now you know about my first attempt at Sandy Beach! I look up just for a microsecond to check the wing and voila....here she is just falling out of the sky. So I lift the A's and up comes the wing directly over head, I check to make sure the wing is set, no crossed lines.....good to go. Left over right turn left... I proceed to add power and I make sure to let the motor lift me off the ground (as opposed to jumping in my seat) smoothly progressing to full throttle....up, up and away I go...... I start a right hand turn out to coiincide with the motors natural tendency to turn right with the P-factor. I was rewarded with the most wonderful whale watching I have had in 17 years on Oahu. To all my non-motoring friends........ I can only say I missed you! I would love to take that thing for a spin some day. I have often thought you could fly some sweet thermals powering up from the middle of the island. Can I borrow the motor for a quick flight to Molokai and back. At about 5' off the water would be a blast. I just haven't gotten around to paying 6g's for something that might easily end up on the bottom of the ocean. It was fun flying Motorhead Paul's motor at Sandy's that day. Today might be a nice day for buzzing around over the Makapuu lighthouse, and there have been dozens of whales out there lately. So for now I will go quietly. I think I've found one for sale...? Maybe I'll be joining you someday Ken and we'll fly around the island? Send me your email address and I'll send you some of the pics I took of you and Phil. Ken, great article. If you or Tim can send me your favorite shot he took that day, or just let me know if you upload them online anywhere, then I'll be happy to include a preview at the top of your article. Send it to windlines@hawaii.rr.com, thanks. Congrats on a great flight! Might have to hit you up to let me borrow it for my Atis! 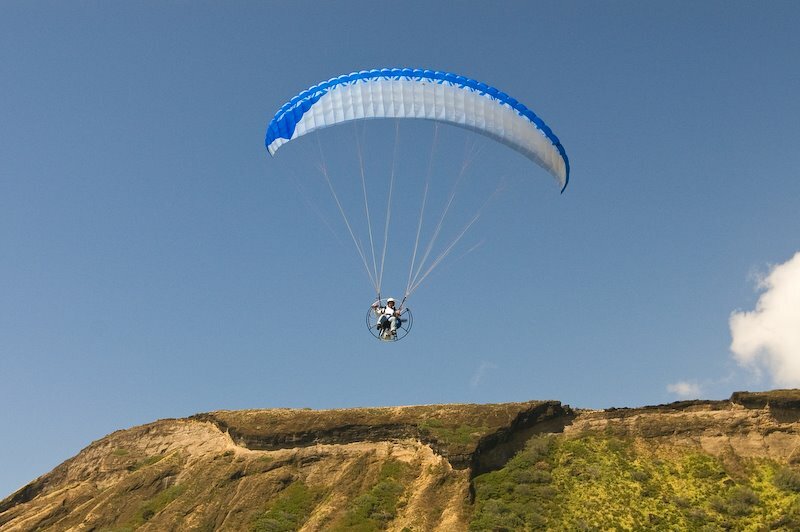 Nice to hear you dusted off the cobwebs and sand blasted the rust of distant memories of motored paragliding. Thought you'd fallen off the earth. 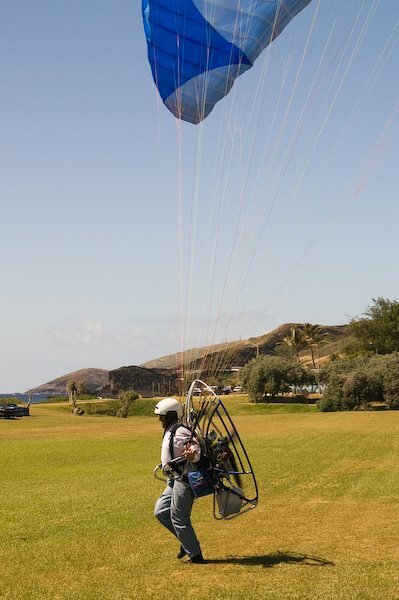 Bill Heaner (former Walker Jet America dealer) now making "flat tops" at Revolution Paramotors is just finishing off a week of powered paragliding in Onomea this weekend. Friday, we motored over Kilauea Volcano, too incredible. Have fun, fly safe. Measuring wind speed is very important for we farmers. We sow paddy and rice and wind has a great effect on this.So our team uses weather instrument to measure wind speed for safety. weatherstationary is an online shop from where you can get the best branded quality weather measuring instruments in a reasonable price. We have bought many cabled and portable instruments from them and these are really good.